Inventory We are a resale marketplace, not a box office or venue. Ticket prices may exceed face value. This site is not owned by BB&T Pavilion . The BB&T Pavilion is the premier outdoor venue in the Philadelphia metro area to catch the summer's hottest touring acts. The BB&T Pavilion box office is located on the Delaware River waterfront on 1 Harbour Blvd Camden, NJ. 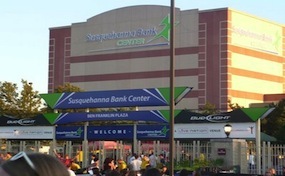 The BB&T Pavilion opened in 1995 and has changed names multiple times from the Blockbuster-Sony Music Entertainment Centre to the Tweeter Center in 2001 and to the Susquehanna Bank in 2008. The facility can be used year round with the capabilities of seating 25,000 in the summer and closing off to a 7,000 seat venue in the fall and winter. Some of the most popular BB&T Pavilion tickets have included Ozzfest, The Who, Pearl Jam, Aerosmith, Metallica, Jimmy Buffett, Dave Matthews Band, and Phish. PavilionCamden.com is a privately held company that specializes in the sale of tickets in the secondary market. We are not affiliated with any official supplier or box office. To purchase tickets to any BB&T Pavilion in Camden events simply call our operators at anytime or click on the event you wish to attend.